The Drug Policy Alliance (DPA) has taken various steps in legalizing marijuana at the state and federal levels and improving medical marijuana programs to better protect patients’ rights and access to medicine. Medical marijuana is used for a wide variety of medical problems, from cancer to epilepsy to depression by more than 1.2 million people. KannaLife Sciences, Inc., a Medical Marijuana, Inc. company secured the very first license to commercialize marijuana with Patent 507 that develops cannabinoid-based medicines for the brain. Medical cannabis producers like Peace Naturals, Tilray, and Tweed which are federally licensed in Canada have exported to Germany, Croatia, New Zealand, Brazil, and Chile. Goldstein Research analyst forecasts that the global medical marijuana market is estimated to be worth USD 7.9 billion in 2016 and will see a compound annual growth rate of 55.6% as other countries liberalize their marijuana laws and international market for cannabis is projected to hit USD 35.67 billion by 2024. The report covers the present ground scenario and the future growth prospects of the medical marijuana market for 2016-2024 along with import and export statistics of the various regions. We calculated the market size and revenue share on the basis of revenue generated from major players across the globe. The market forecast is done on the basis of application focused data of medical marijuana and the legal medical marijuana states and DC in addition with laws, fees and possession limits. Based on application, chronic pain is the dominating segment that contributes to the majority of medical marijuana market share i.e. 22% followed by muscle spasm and multiple sclerosis that is the fastest growing segment and registering the growing CAGR of 56% over the forecast period. Cannabis is most commonly prescribed for pain. This could include anything from migraine headaches to spinal injury. It can also be helpful for patients experiencing nausea and appetite loss, such as those undergoing chemotherapy. 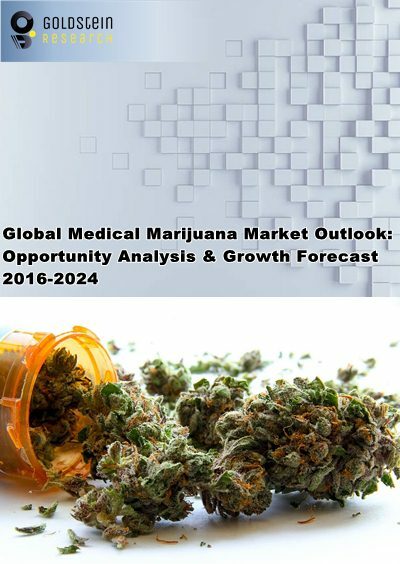 Medical Marijuana Market Outlook 2016-2024, has been prepared based on an in-depth market analysis from industry experts. The report covers the competitive landscape and current position of major players in the global Medical Marijuana Market. The report also includes porter’s five force model, SWOT analysis, company profiling, business strategies of market players and their business models. Global Medical Marijuana Market report also recognizes value chain analysis to understand the cost differentiation to provide competitive advantage to the existing and new entry players. Our global Medical Marijuana Market report comprises of the following companies as the key players: Cara Therapeutics Inc., CannaGrow Holdings, Inc., Cannabis Sativa, Inc., United Cannabis Corporation, GrowBlox Sciences, Inc., GW Pharmaceuticals, plc, Lexaria Corp, International Consolidated Companies, Inc, Peace Naturals, Tilray, and Tweed. According to the report, major driving factor for medical marijuana market is that it’s an effective medicine which produces conditions that may alleviate the symptoms of cancer, glaucoma, HIV or AIDS, cachexia, severe pain, severe nausea, seizures (including those that are characteristic of epilepsy), or persistent muscle spasms (including those that are characteristic or multiple sclerosis) and any chronic or debilitating disease or treatment for such diseases where patients (or their primary caregivers) may legally possess no more than one ounce of usable marijuana. Further, the report states the major challenge is females are more sensitive to cannabis' painkilling qualities, but they are also more likely to develop a tolerance for the drug, which could contribute to negative side effects and dependence on marijuana. Marijuana can be deadly to animals if not given according to the veterinarian prescription. Based on geography, North America dominate the global medical marijuana market with the market share of 37.6% in 2016 owing to merger and acquisition activity is heating up in Canada, which has put a spotlight on the growing disparities between the U.S. and Canadian cannabis industries and California being the only state with a larger medical marijuana industry than Michigan’s. Europe is the fastest growing medical marijuana market owing to its medicinal values in the treatment of chronic pain, muscle spasm and others. While all African nations are capable of cultivating medicinal marijuana to exploit a growing international acceptance of cannabis-based medicines and creating the market opportunities for the vendors. What is the revenue of Medical Marijuana in 2015-16 and what would be the expected demand over the forecast period?